The quizzing glass or quizzer was a popular accessory during the Georgian and English Regency eras. It consists of a single round, oval or oblong lens rimmed in gold, silver or pinchbeck. Some of the handles are quite elaborate and might even have compartments containing such items as vinaigrettes or a lock of hair. The loop of the handle often swivels to make it easier to lay flat when hung from a chain. Depending on the owner’s needs a quizzing glass was either set with a magnifying lens or a corrective lens. The lenses were made by opticians and were most likely set into frames provided by goldsmiths and jewelers. The quizzing glass appears to be an innocuous item that would have been used to assist a person who had poor vision, but when you look deeper you discover it was much more than that. I first became enamored with antique quizzing glasses when I read Slightly Married by Mary Balogh. The novel introduced the powerful and coldly disciplined Wulfric Bedwyn, the Duke of Bewcastle, who had the ability to intimidate people by simply studying them through his quizzing glass. Georgette Heyer also featured this Regency accessory in some of her novels such as An Infamous Army, The Corinthian, and Devil’s Cub. Maybe it’s because of stories like these that people often associate quizzing glasses with haughty English aristocrats or dandies. But the popularity of using lenses for more than reading might actually have begun in France with the use of the lorgnette. 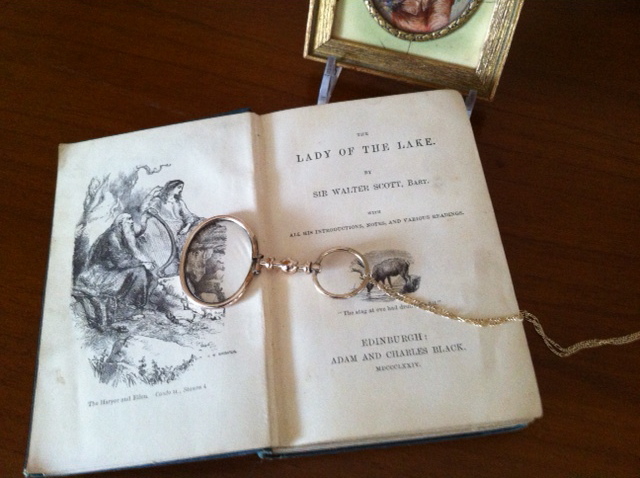 The lorgnette is a pair of glasses a person would hold up to their eyes by a handle and was popular in France during the late eighteenth century. Lorgnette comes from the French lorgner, “to peer at.” Frenchmen began using them for unashamed observation of feminine beauty. In an article entitled “Les Lorgneurs” by Mercier, published in the Tableau de Paris in 1793, there is a wonderful description of how bold these Frenchmen were. In England the single lens quizzing glass became a fashionable way to observe people and objects. 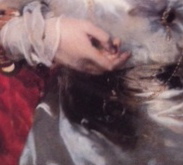 It was possible to issue a set-down simply by peering through the lens of a quizzing glass with a critical eye. Hogarth, Rowlandson and Cruikshank all caricatured its use. And famous quizzing glass users included Beau Brummell and Charles James Fox. The fashion was not limited to men as women also took to wearing them. Typically a man would wear his quizzing glass about his neck with a black ribbon and a woman would suspend hers around her neck by a long chain. 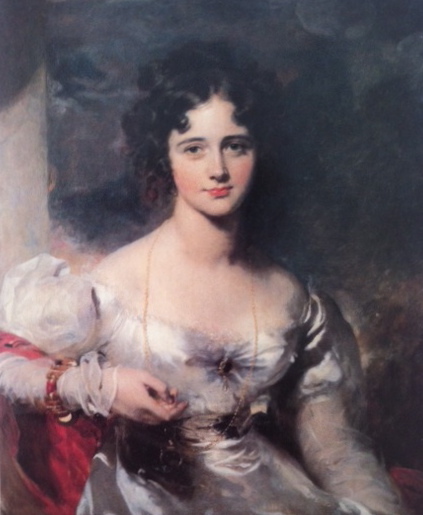 In the painting below of Miss Rosamond Crocker by Sir Thomas Lawrence you can see how fashionable this accessory had become. So the next time you are on line at a shop and some rude patron tries to cut you off, just think how fabulous it would be if you could simply peer at them through a quizzing glass to put them in their place. Oh and by the way, the one that I wear has also come in handy when my friends are trying to read the small type on restaurant menus. It really is quite a versatile accessory.